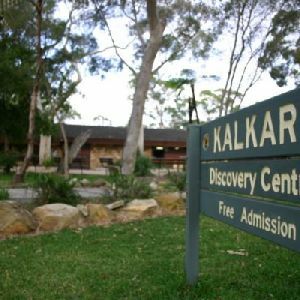 Seperate male/female wheelchair accessible toilets. 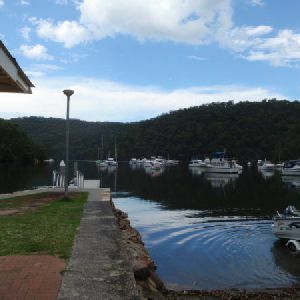 Entrance is 83cm wide (with no step), hand basin 80cm high, toilet seat 47cm high with a handrail. 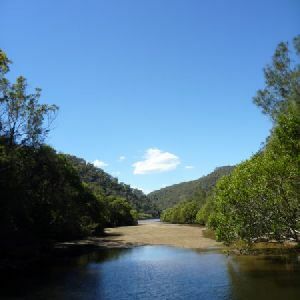 Toilet is located at the far southern end of the reserve, just over 300m along concrete and compressed dirt path. Potable water and other toilets also available. and town water. 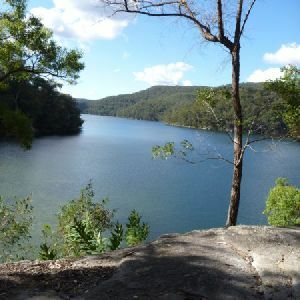 The southern part of Crosslands is managed by Hornsby Council and the northern half by the NPWS within the Berowra Valley National Park. 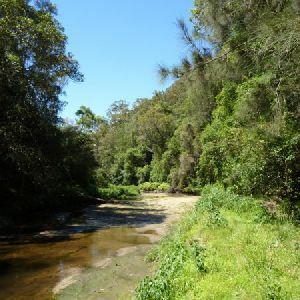 The first inhabitants of this area were a subgroup of the Dharug people who enjoyed the sandstone caves, fish and abundant plant life in the area. 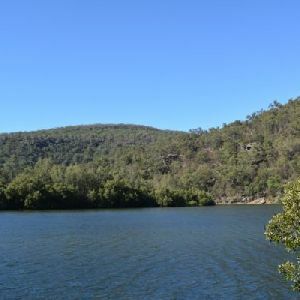 It is now managed by Hornsby Shire Council, but in 1856 Matthew Charlton asked Burton Crossland to be caretaker on this area. 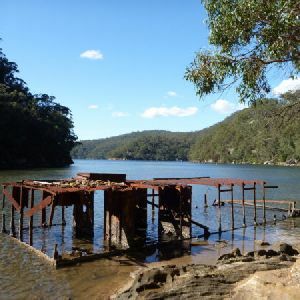 Burton built a house and made a living by harvesting timber, growing fruit, fishing and boat-building. 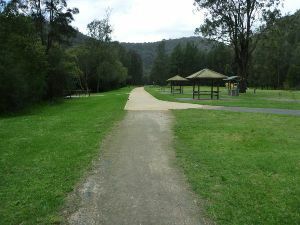 From the car park, this walk follows the flat dirt path between the road (on the right) and creek (on the left). 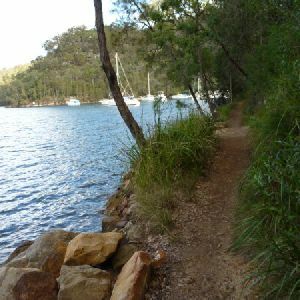 The path leads through the casuarina trees for about 120m to pass the boat ramp. After another 120m this walk comes to a locked gate at the northern end of the car park. 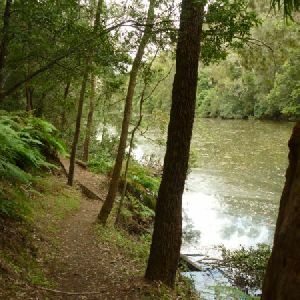 There is also a wetland through the trees to the right worth noticing. 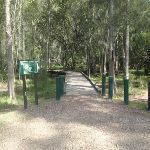 Link from carpark to path is across exposed ground (muddy after rain) and between timber bollards that are 80cm high and 1.5m apart. A timber slat picnic table and bench seat. The table is 77cm high, 73cm deep and 2.4m wide. The seats are 47cm high, 29cm deep and 2.4m wide. On a conrete slab (3×5.5m) and about 7m (across grass) from the path. A timber slat picnic table and bench seats. The table is 77cm high, 73cm deep and 2.4m wide. The seats are 47cm high, 29cm deep and 2.4m wide. On a conrete slab (2.8×4.1m) and about 4m (across grass) from the path. A timber slat picnic table and bench seats. The table is 77cm high, 73cm deep and 2.4m wide. The seats are 47cm high, 29cm deep and 2.4m wide. 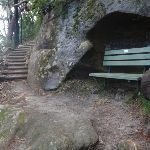 On a conrete slab (2.8×4.1m) and about 11m (across grass) from the path. A timber slat picnic table and bench seats. The table is 77cm high, 73cm deep and 2.4m wide. The seats are 47cm high, 29cm deep and 2.4m wide. On a conrete slab (2.7x4m) and about 16m (across grass) from the path. Male and female toilet block. Entrance is 90cm wide, hand basins 90cm high, cubical doors 80cm wide, toilet seat 42cm high. Male toilet has a urinal with 20cm step. No handrails. 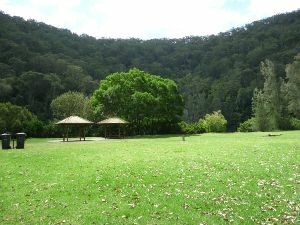 Toilet entrance is about 35m across grass from nearest path. A timber slat picnic table and bench seats. The table is 77cm high, 73cm deep and 2.4m wide. The seats are 47cm high, 29cm deep and 2.4m wide. On a conrete slab (3×5.5m) and about 25m (across grass) from the nearest path. A timber slat picnic table and bench seats. The table is 77cm high, 73cm deep and 2.4m wide. The seats are 47cm high, 29cm deep and 2.4m wide. 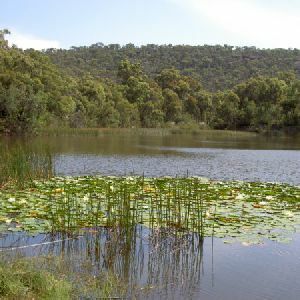 On a conrete slab (3.8×5.5m) and about 25m (across grass) from the nearest path. A roofed timber slat picnic table and bench seats. The table is 81cm high, 84cm deep and 2.8m wide. The seats are 47cm high, 29cm deep and 1.7m wide. 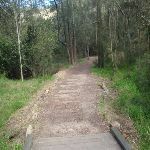 On a paved area (5.6×5.6m) and about 25m (across grass) from the nearest path. Two roofed timber slat picnic tables and bench seats. The table is 81cm high, 84cm deep and 2.8m wide. The seats are 47cm high, 29cm deep and 1.7m wide. 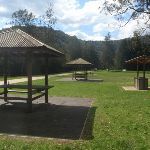 On two joined paved area (~5.6×5.6m) and about 30m (across grass) from the nearest path. , as well as garbage bins. 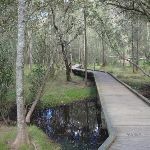 The eastern side is home to a boardwalk exploring the estuarine wetland. 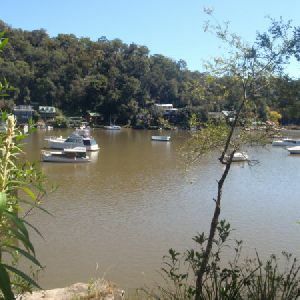 A pleasant area to rest and enjoy the water. Fires are only permitted in formally established fire places . 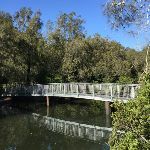 (0.51km) Crosslands North → Estuaries viewing platform int. 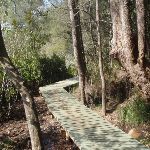 There is a 4cm step from between the dirt path and the northern end of the timber boardwalk.
. 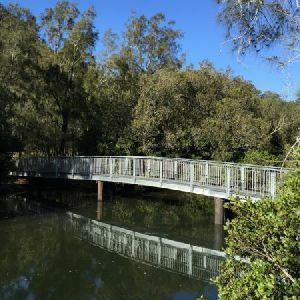 The timber boardwalks winds through the mangroves for about 60m, coming to a firm dirt track which leads for another 70m to a second timber boardwalk. 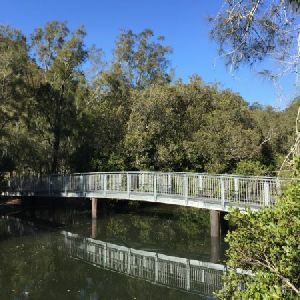 The second boardwalk leads for another 70m, past ‘Mangrove Food Cycle’ information signs to come to an 3-way intersection in the boardwalk with the estuaries viewing platform boardwalk (on your left). Two timber slat bench seats built into timber viewing platform. Each seat are 41cm high, 28cm deep and 2.5m wide with a 54cm high backrest. 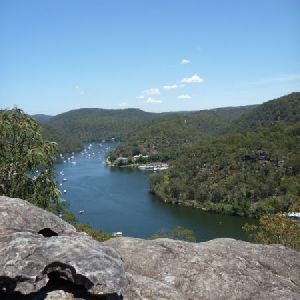 encouraging you to take some time to soak up this view. 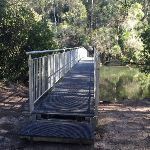 Continue straight: From the intersection at the estuaries viewing platform, this walk follows the timber ramp down to the dirt track and heads past the ‘..unsuitable for wheelchair access’ sign. The track leads alongside the wide creek for about 200m to the ‘All creatures great and small’ information sign, then down a little way further to head along a short section of timber boardwalk. About 100m further along the rocky track, this walk comes to a lookout and a ‘Catch the Threats’ information sign, where the track continues past the bench seat and alongside the creek to the ‘The Rock Club’ information sign. 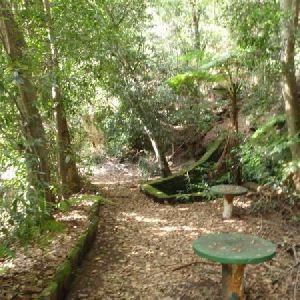 The track then leads among some grass tress for just over 100m to the ‘Bush Supermarket’ information sign. 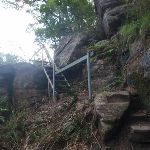 Just past this sign, the track begins to climb fairly steeply up the stone and timber steps to the ridge line, marked with a GNW arrow and a ‘Stop! Look! Listen! and Smell!’ information sign. 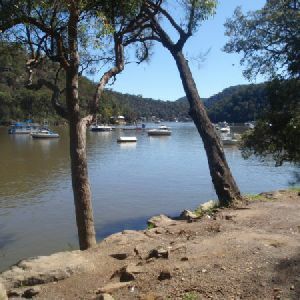 Veer left: From the intersection, this walk follows the ‘Berowra Waters’ sign along the timber boardwalk. 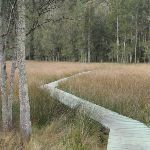 The boardwalk leads for about 80m across the large open flat saltmarsh into the casuarina forest on the other side. 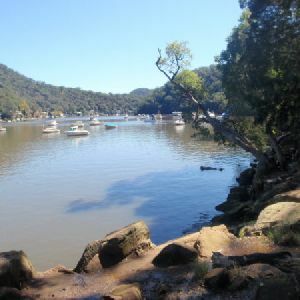 Here the track bends left and leads along the side of the saltmarsh for almost 200m, where the rocky track leads a little further before coming alongside Berowra Creek’s mangroves. 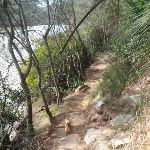 The track continues to gently undulate along the side of Berowra Creek for about 650m among the casuarinas and grass tress, before heading up a fairly short, steep climb. 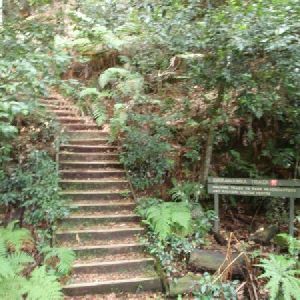 At the top of this climb, the walk comes to a small, flat, pleasant clearing surrounded by large boulders. 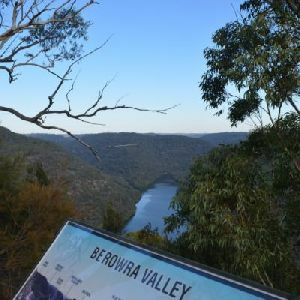 Turn left: From the intersection, this walk follows the ‘Berowra Waters’ sign gently down along the management trail, keeping the valley to your left. 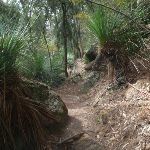 The trail gently undulates along the side of the hill, enjoying some glimpses up to the cliff faces (on the right). 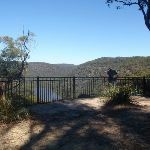 After about 180m, the trail crosses a concrete drain, then leads up the hill to find the signposted ‘Naa Badu’ lookout and its great view. 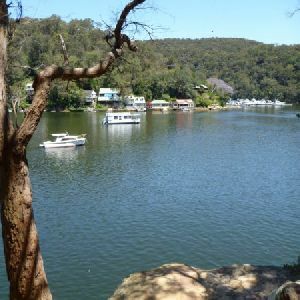 2.4km of this walk has short steep hills and another 730m is flat with no steps. 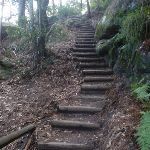 Whilst another 670m is very steep and the remaining 260m has gentle hills with occasional steps. 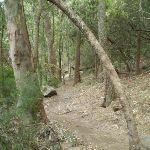 3.1km of this walk follows a formed track, with some branches and other obstacles and another 730m follows a smooth and hardened path. 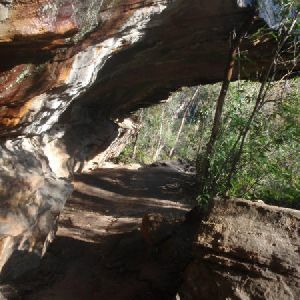 The remaining (260m) follows a clear and well formed track or trail. Around 3.1km of this walk has directional signs at most intersection, whilst the remaining 990m is clearly signposted. 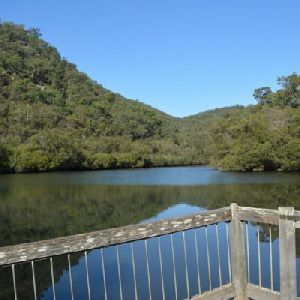 2.4km of this walk requires some bushwalking experience and another 990m requires no previous bushwalking experience. 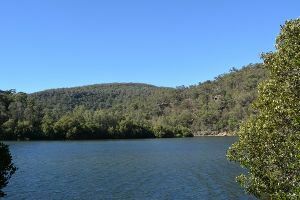 The remaining (670m) requires a leader a with moderate level of bushwalking experience. 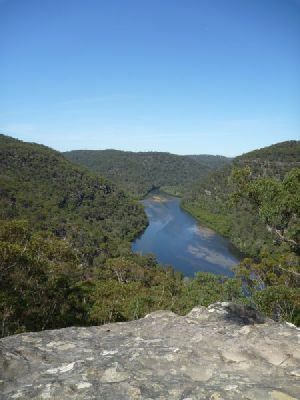 Around 3.4km of this walk is close to useful facilities (such as fenced cliffs and seats), whilst the remaining 670m has limited facilities (such as not all cliffs fenced). 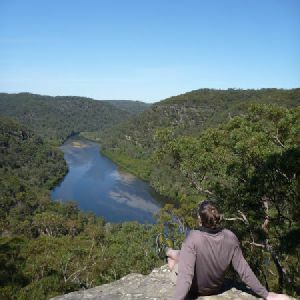 A list of walks that share part of the track with the Crosslands to Naa Badu Lookout return walk. 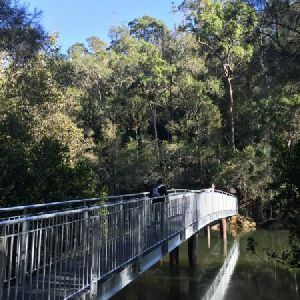 A list of walks that start near the Crosslands to Naa Badu Lookout return walk. 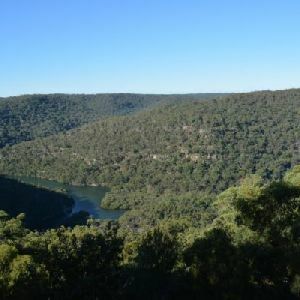 http://new.wildwalks.com/wildwalks_custom/includes/walk_fire_danger.php?walkid=nsw-bvrp-ctnblr Each park may have its own fire ban, this rating is only valid for today and is based on information from the RFS Please check the RFS Website for more information.